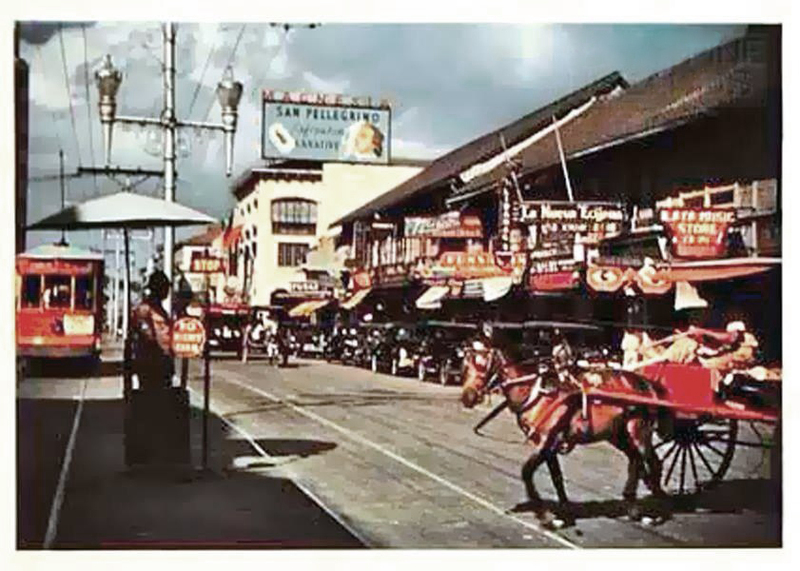 As a young lad in the Manila of the Fifties, I was a pretty independent sort, usually traveling from our Remedios St. home to the downtown areas. Eschewing the larger buses, my preference was to climb aboard a jeepney , hoping to find the choice seat in front, next to the driver. 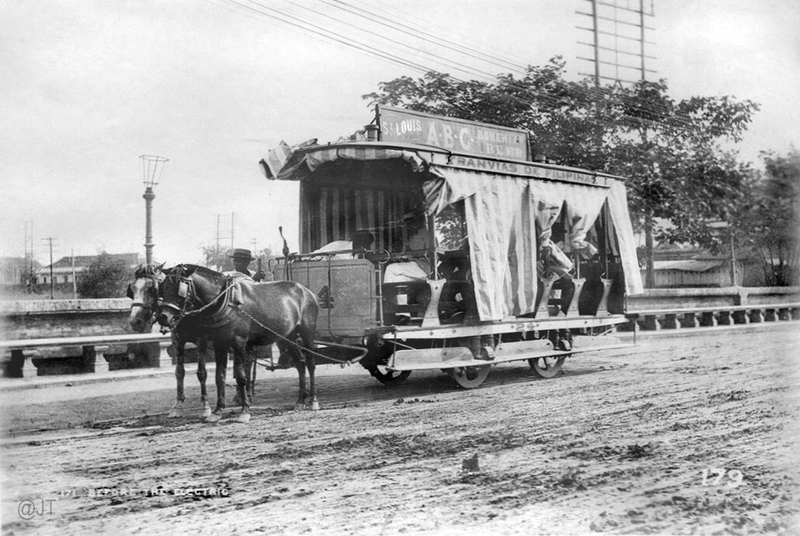 The fare was cheap, as I recall it may have been ten centavos to travel all the way downtown. 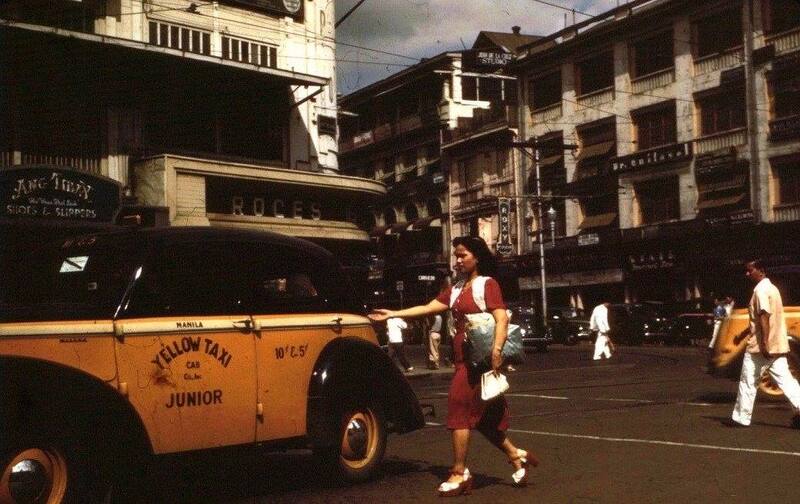 Mom’s favorite stories would revolve around Manila before the war. Inevitably, she would describe the available alternative modes of transportation: Taxis, Autobuses, caretelas and small Austin Bantam jitneys (known as autocalesas) but her choice was the Tranvia, when each morning she would board from the Sampaloc area to Plaza Goiti, transfer to a southbound car to the Malate area where she worked at a small dress shop. Tranvia ? My interest piqued as she would relate the clang-clanging bells, the slow-paced car rolling and rocking along rails that were already over 30 years old by that time. I wondered how on earth the smaller streets, choked with traffic, could possibly accommodate such large dinosaur-like public conveyances. 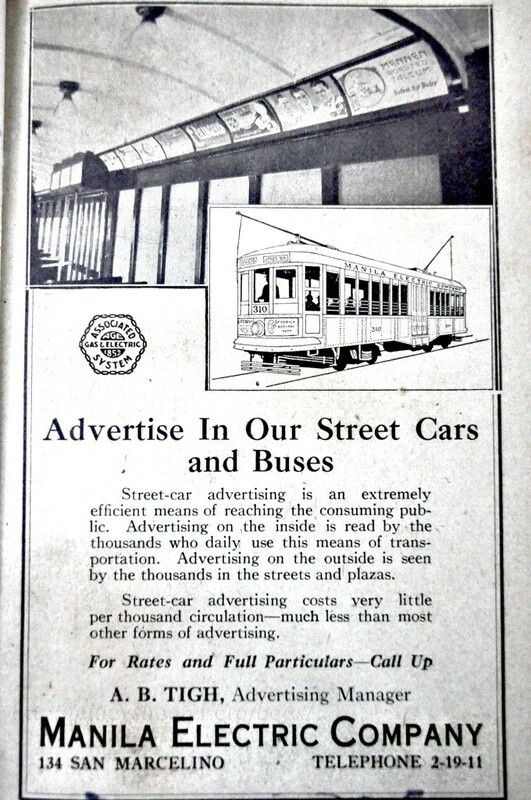 Images of San Francisco cable cars and old European cities with their trams came to mind. As a matter of fact, on a recent riverboat cruise from Prague to Budapest, I was delighted to see the older, classic trams still operating. 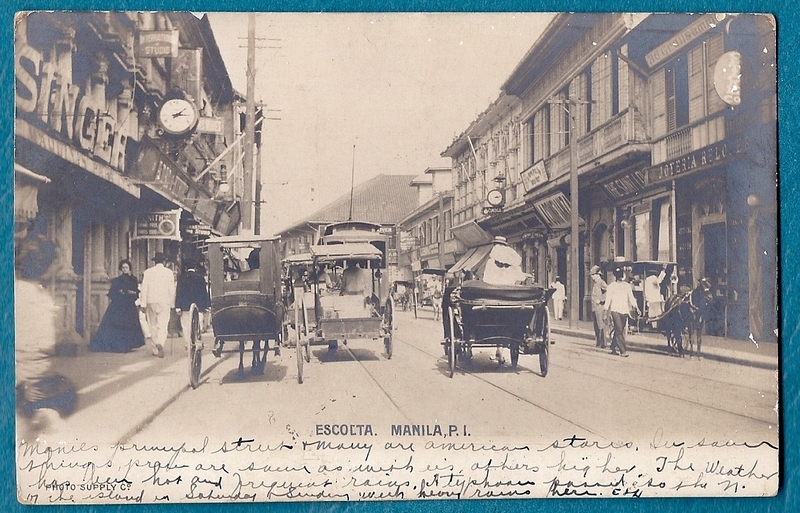 Manila’s traffic in the Fifties was comprised of a unique combination of vehicles, ranging from the ever-present and wildly bedecked jeepney, the rickety buses that caromed around traffic to pick up a waiting passenger by curbside, the poor cochero with his typically lean and sinewy horse fighting for a bit of space in the already crowded streets– all exuding noxious vapors and smoke exhaust (except for the poor horse that had his own exhaust). 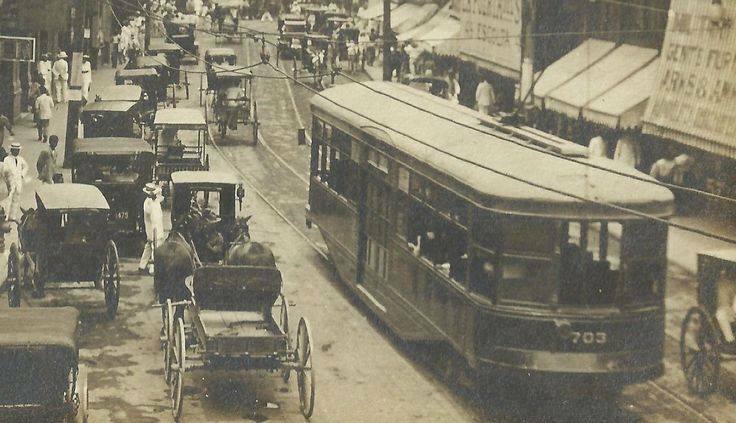 Much has already been written, and done very well, about these modes of transportation so instead, I thought I’d offer a pictorial review in hopes these old photos may trigger a nostalgic memory for my readers. 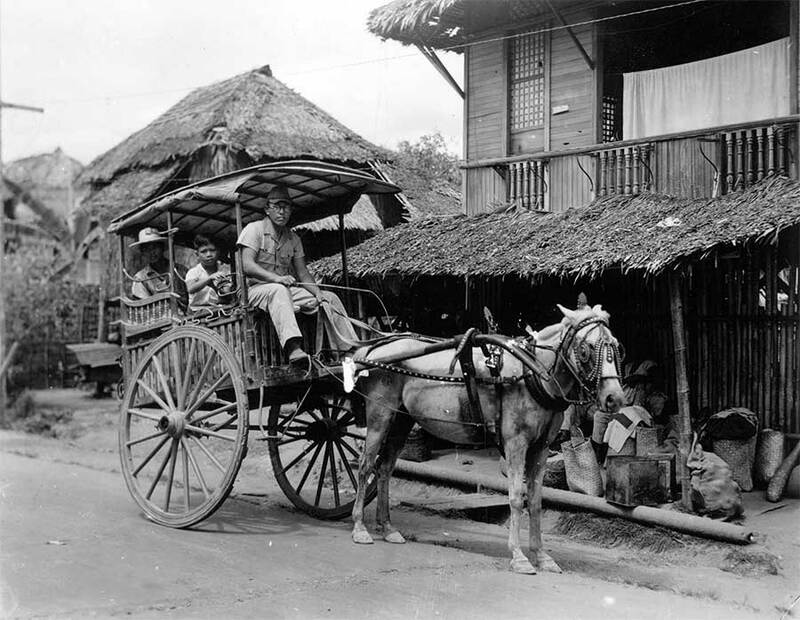 Of course the oldest form of transportation were pulled by horse or carabao (usually non-passenger) drawn vehicles. There was the calesin, calesa, carromata, and carretela. 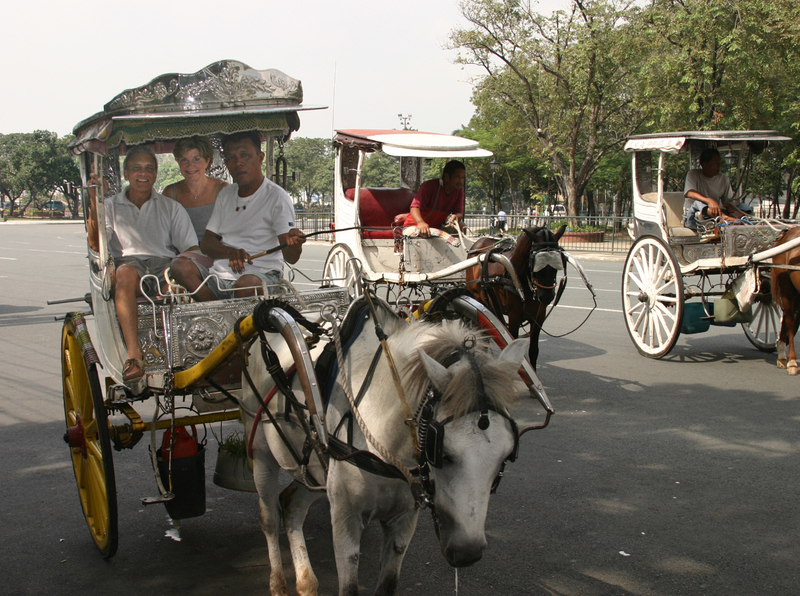 Parading the Luneta to enjoy the cooler evening breezes, Manila’s elite would take to their carriages in their personal caruajes or public calesas and calesins. All went in one direction while the Archbishop and other notables went the other. 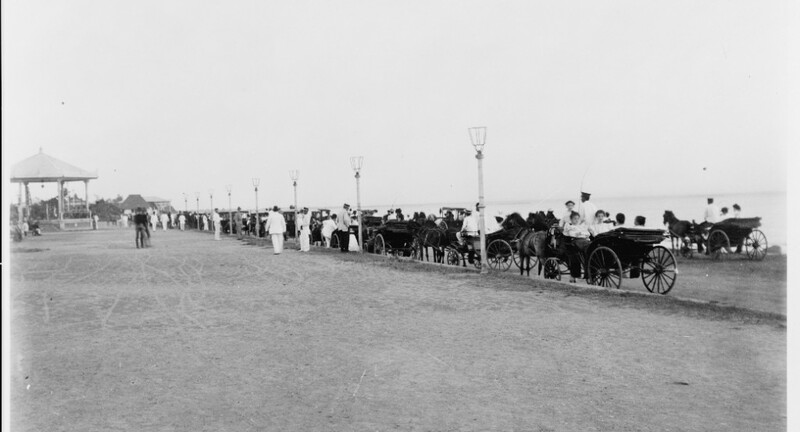 Calesin awaiting passengers by the Hotel Oriente – 1900. The next photo is rather meaningful as it signaled the introduction of automobiles with the outdated horse-drawn carriages left over from the Spanish era. 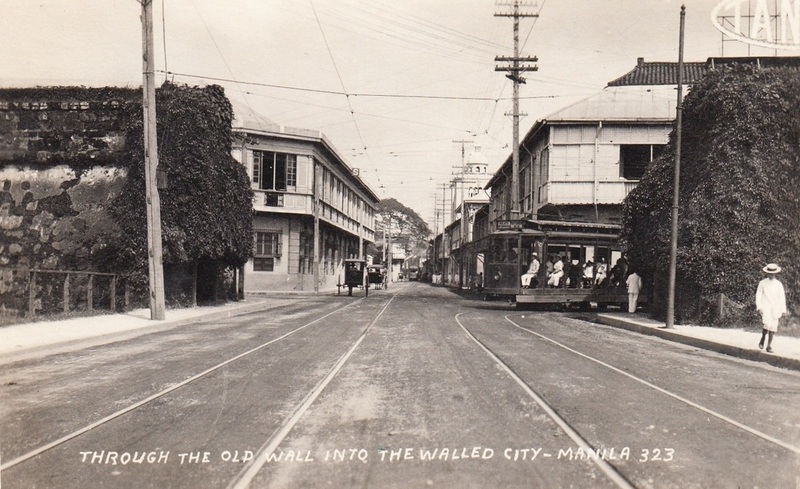 Taken on Rizal Avenue by the Kneedler Building, c.1920s. My wife Michelle and I in Manila in 2004. 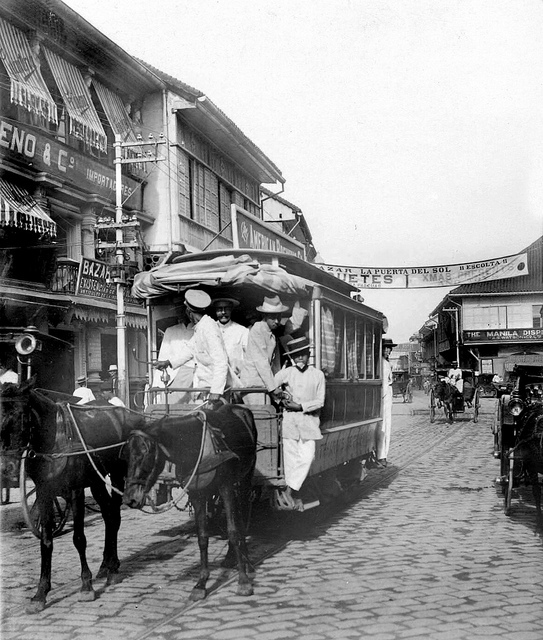 The original “tranvia” evolved from a horse-drawn tram operated by Compañía de los Tranvías de Filipinas formed by Jacobo Zobel and partners in 1882, to the electrically powered cars of pre-war. 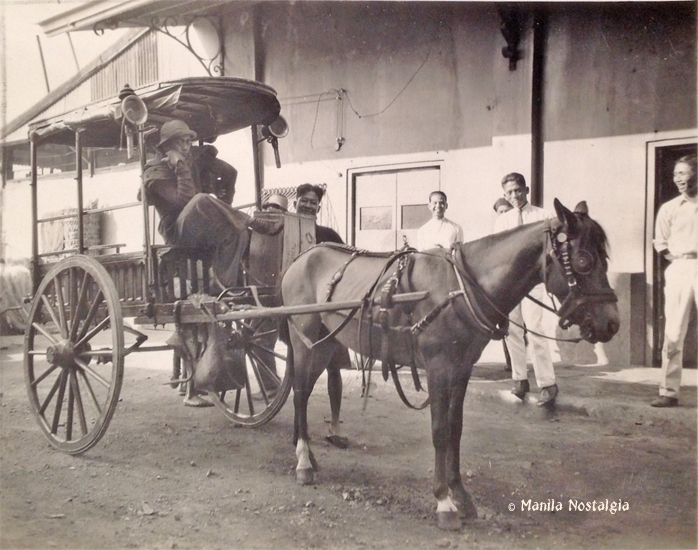 In 1904, Meralco (Manila Electric and Light Co.) acquired both the Compañía de los Tranvías de Filipinas, a firm that operated public transportation and ran Manila’s horse-drawn street railways, and added La Electricista. 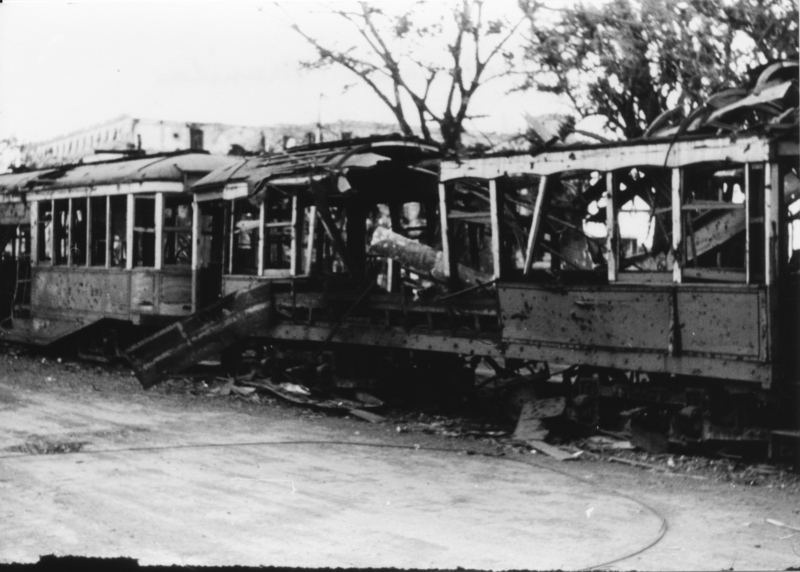 Construction on the electric tramway began that same year. The cars evolved from open-sided to closed; orange in color, the tranvias plied their way on rails throughout the city. Tranvia going down the Escolta. Tranvia turning the corner onto Gral.Luna – behind is the Lourdes Church. Few people may remember the tranvias were orange in color. 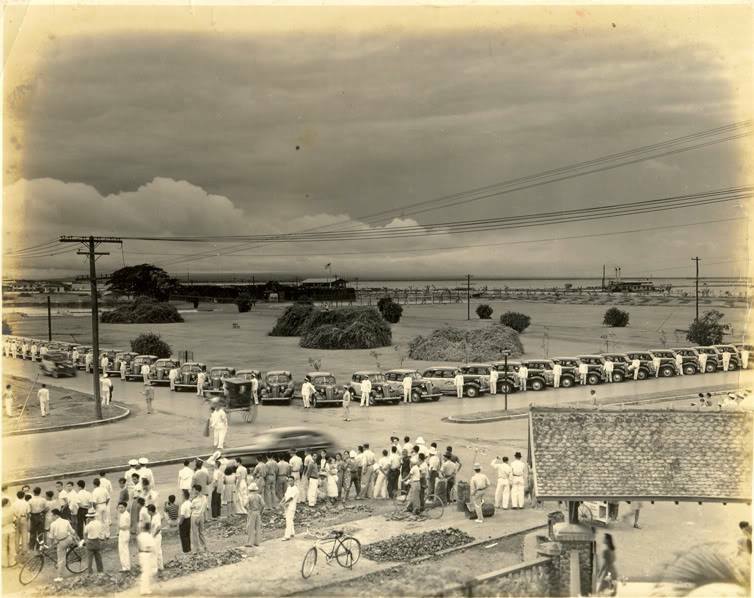 In the remaining days of the Japanese occupation, the Tranvias eventually broke down for need of repair and lack of spare parts. Taxis and private cars were confiscated by the Japanese and any remaining autos could not be powered as gasoline was scarce and only available for the military effort. 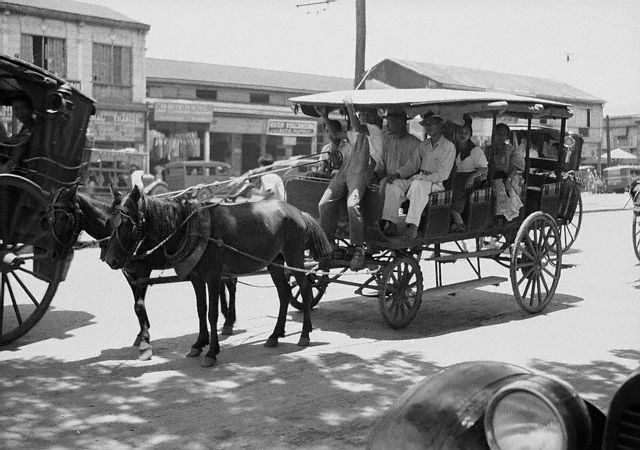 It was at this time that Filipino ingenuity sparked a new form of vehicle called a dokar. It was a cannibalization of an automobile chassis and tires pulled by a horse. With the scarcity of gasoline, tranvias and calesas were the only viable means of transportation. Below, passengers climb on – pushing and shoving to get on. This reminds me of the Japanese railroad cars of today where the conductors actually shove passengers inside. 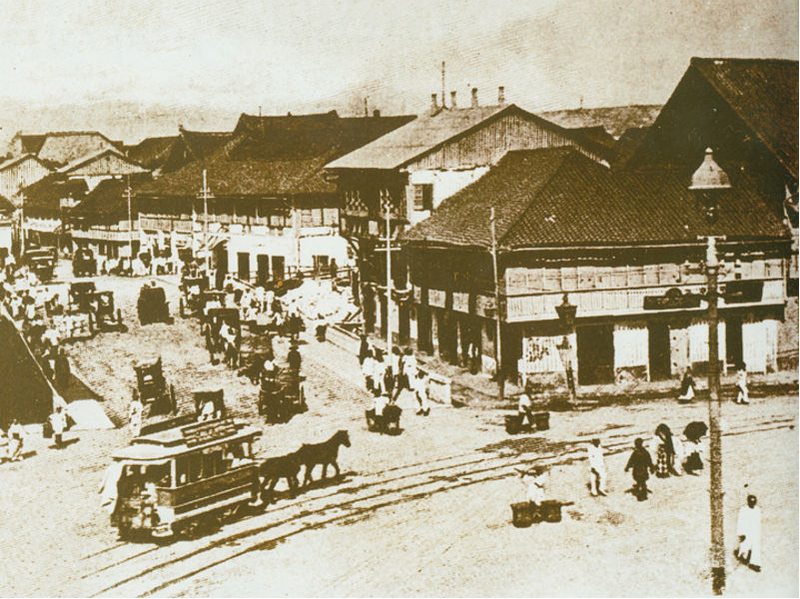 Rizal Avenue during the Japanese occupation. 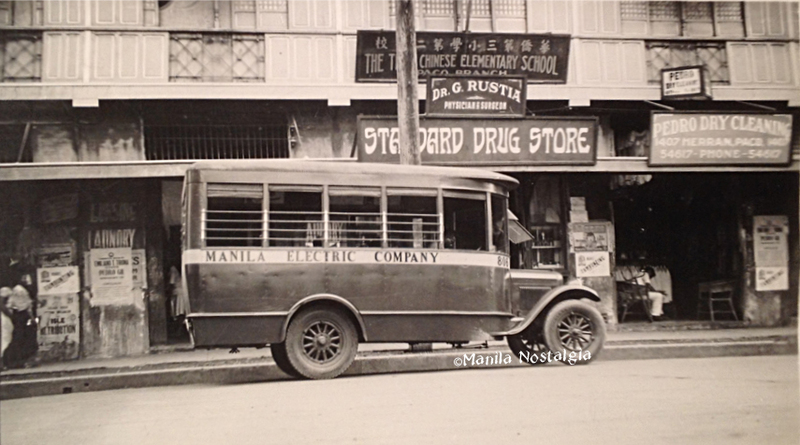 How I remember the large bright colored buses winding their way down main streets: Taft and Rizal Avenues, Mabini, and Quiapo Boulevard. Some were open sided but most had one side entrance where the conductor would precariously hang on, collecting fares and handing out paper tickets. 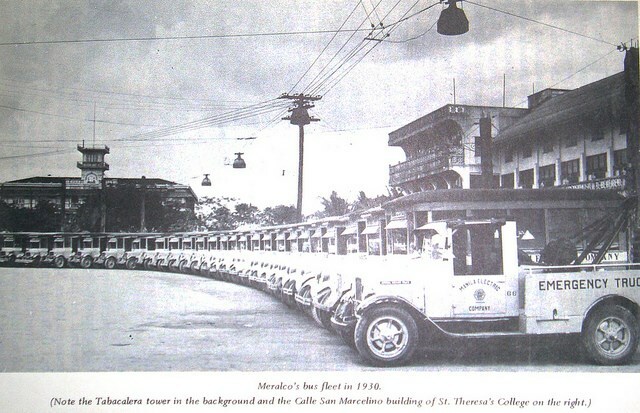 Meralco not only ran the tranvias, they also operated autobuses as well as providing the city with electricity and light. 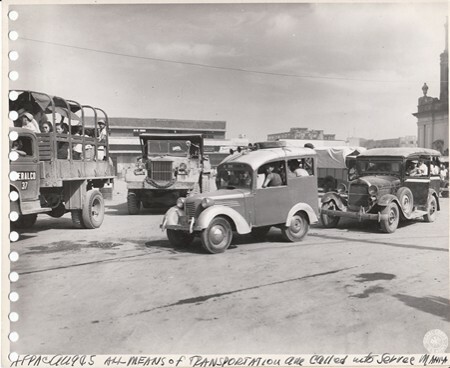 After the war, public transportation had to rely on the thousands of 6×6 trucks and Jeeps that were abandoned by the U.S. military. 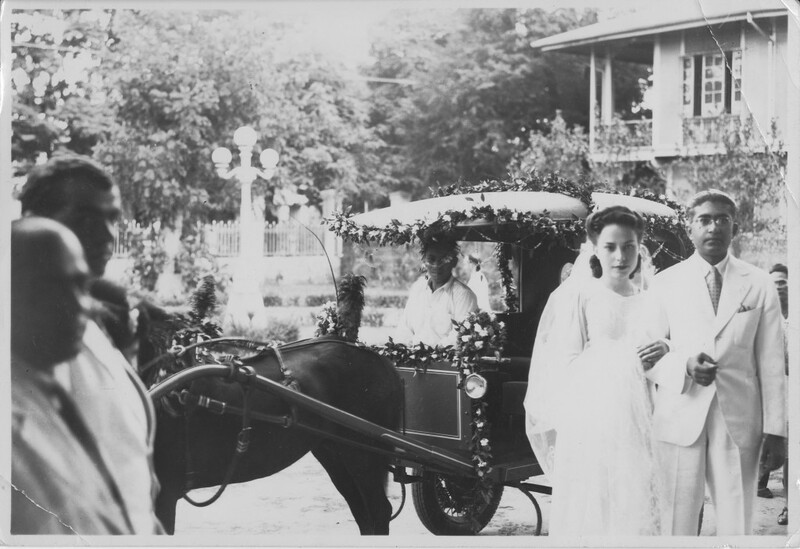 The famous Filipino creativity to make do immediately came about establishing a new era of public conveyances. 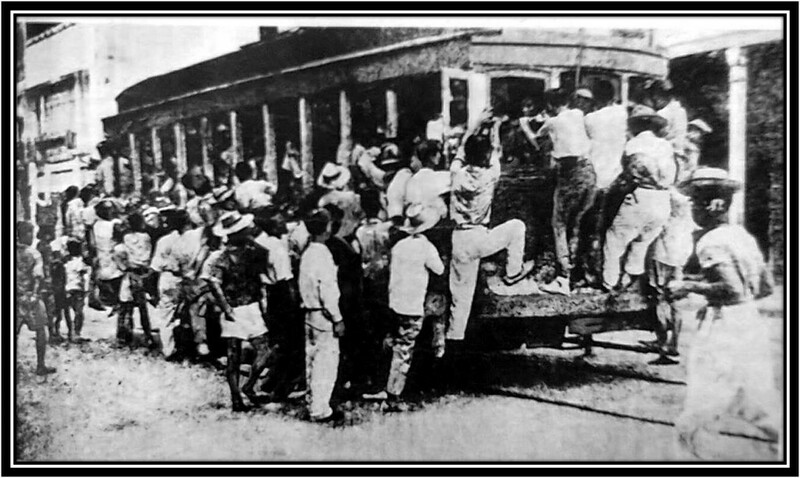 Below, probably one of the first to be converted was the “Libertad Express”. 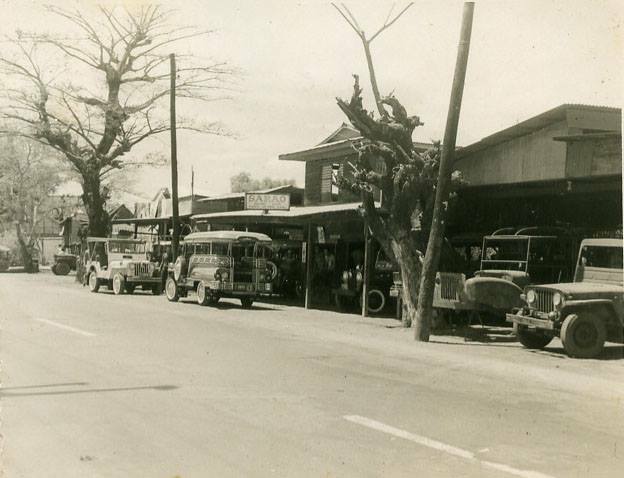 This photo shows a 6×6 truck on the left operated as Meralco bus #37 running next to an old prewar autocalesa. 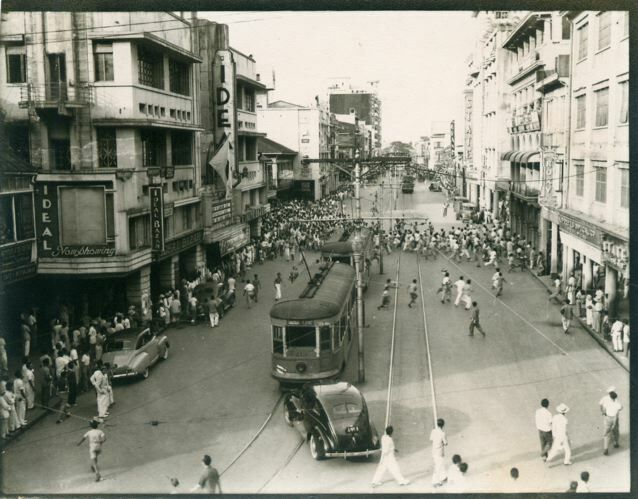 In what may have been a foreboding sign of Manila’s current traffic problems, the photo below shows 1949 Manila already clogged with buses and jeepneys on a very narrow street. 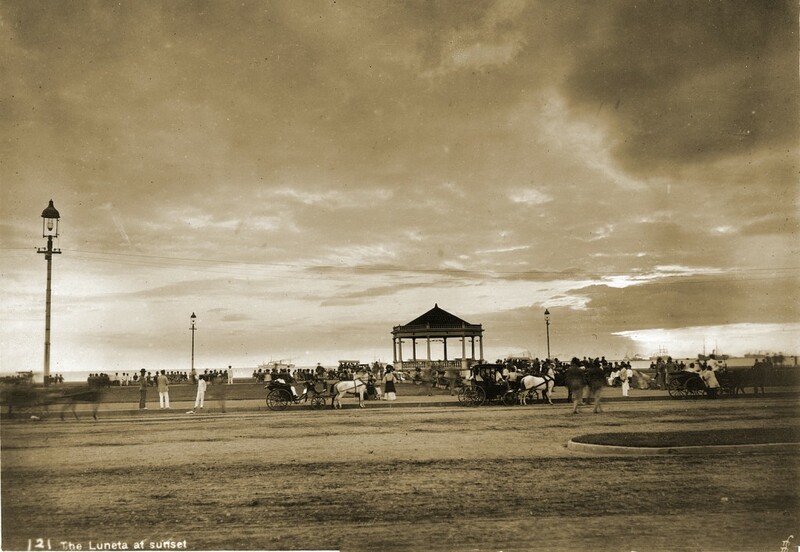 Of course, for sheer enjoyment of riding a double-decker bus along Dewey Boulevard, nothing was better than enjoying the cool Manila Bay breezes at dusk on top of the Matorco. Manileños complain about today’s traffic. 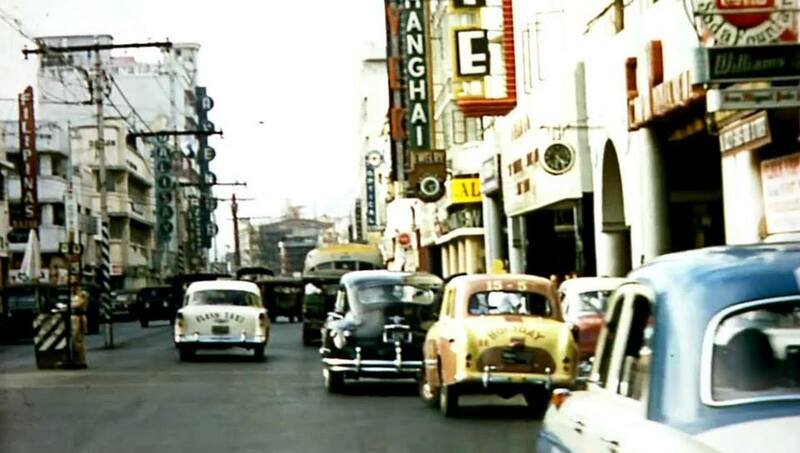 But the traffic of yesteryear may have been just as chaotic although not quite as choked as today. 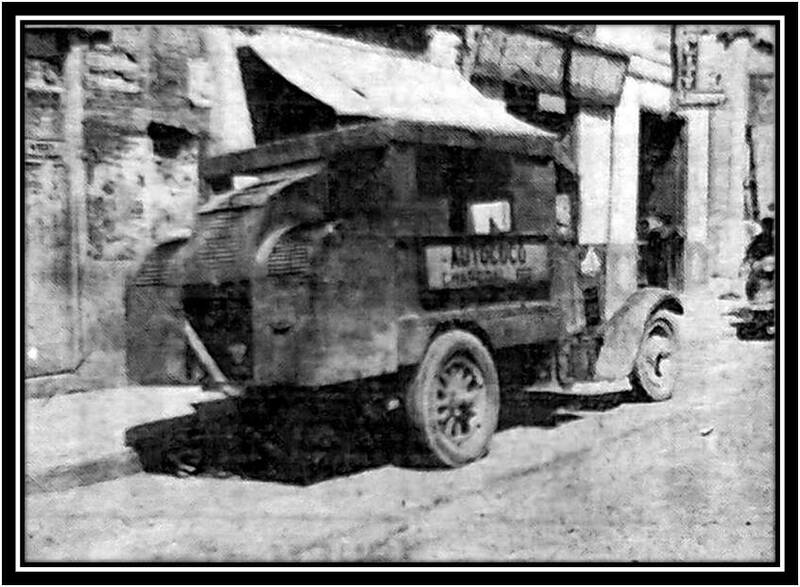 Even after the war, the little Austin Bantam autocalesa was seen. 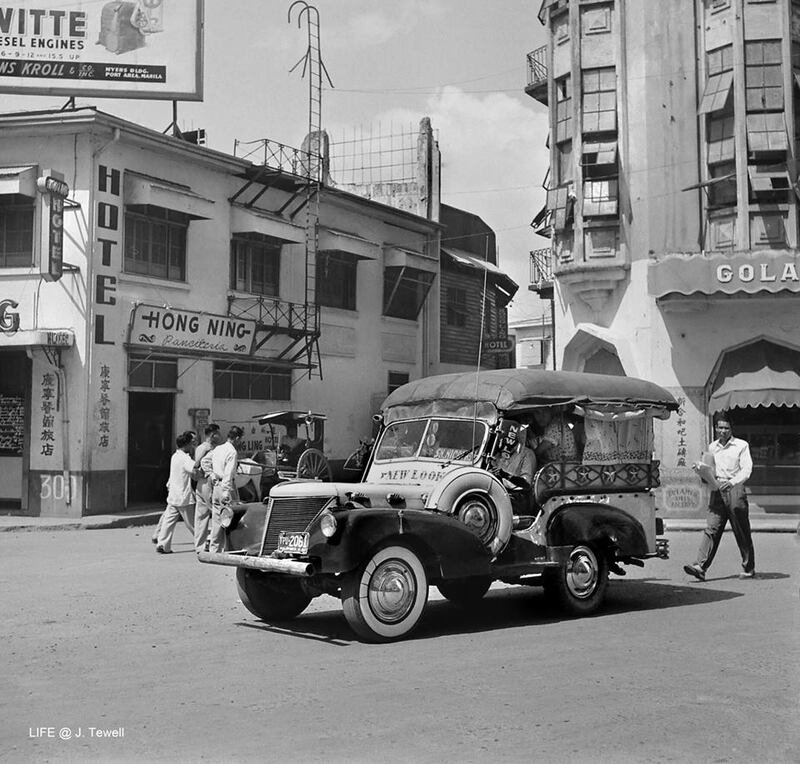 This appears to be a hybrid of the old with the new garishly-decorated jeepney, probably taken around 1949. 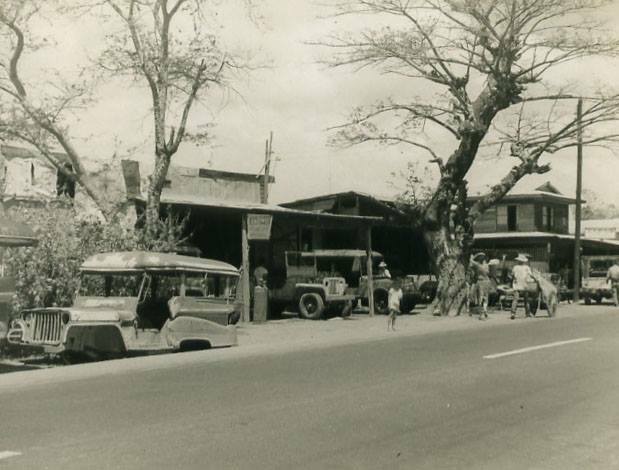 Thousands of the military jeeps remained after the Americans left. 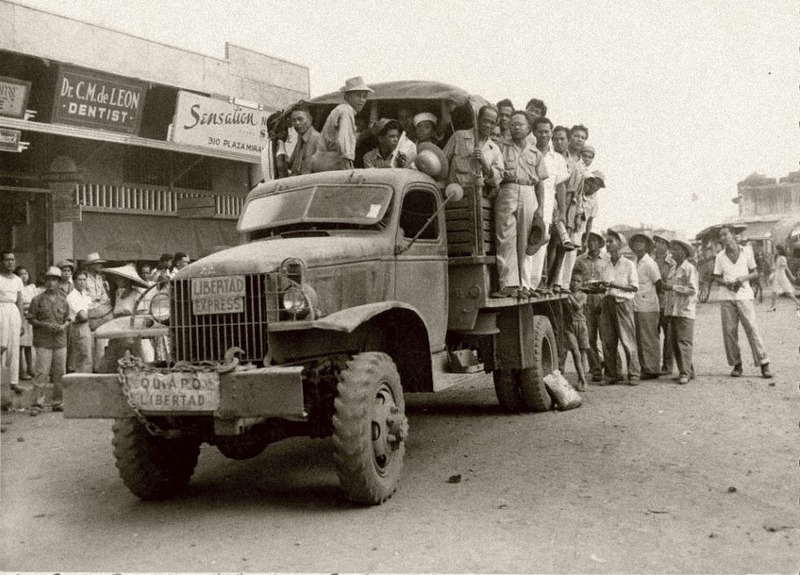 Reliable, cheap and with ample spare parts, the jeep made it into mainstream Filipino transportation. They were being sold for about $50 each. Of course Filipino creativity came to play as these hand-made customized vehicles displaying unique adornments that reflected the driver’s passion and style flooded the streets. 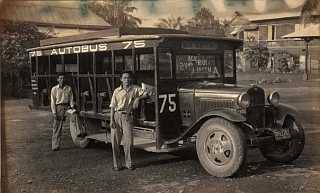 One of the most celebrated and favorite jeepney makers was Sarao Jeep. 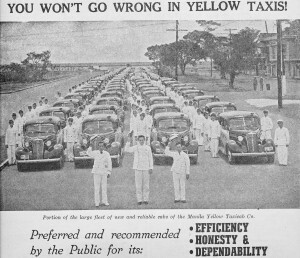 Taxis – Taxis were to be found everywhere or you could call for service. They were cheap. 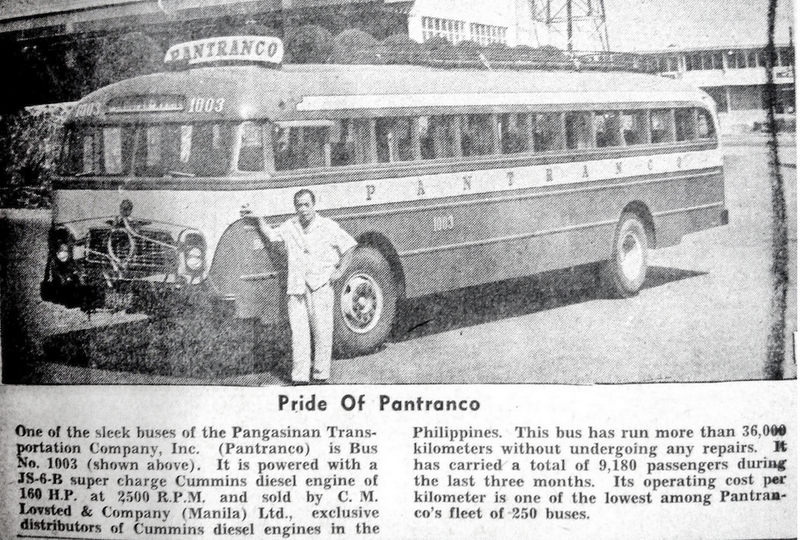 In the Fifties, rates were usually 15 centavos flag down and 5 centavos per 1/2 kilometer. Why so cheap ? Remember, gas hovered around 25-30 centavos a liter. 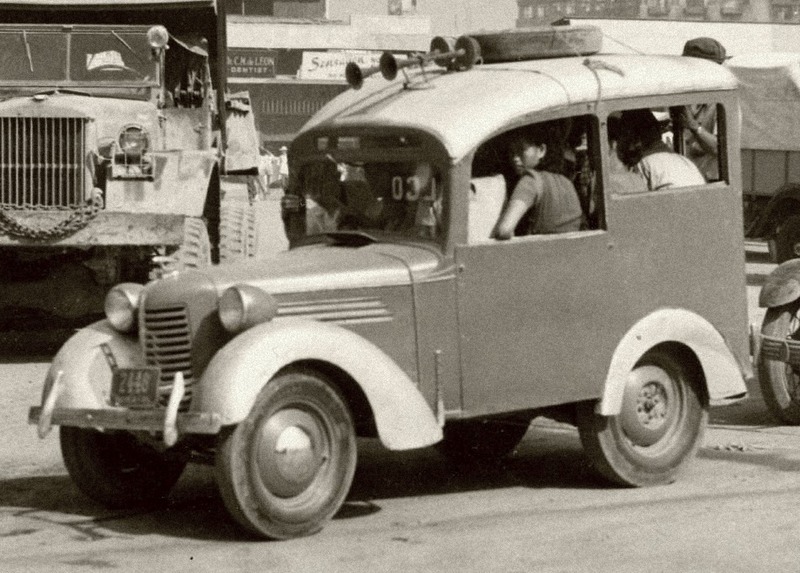 Taxi drives by the Jai Alai, c.1930s. You may have noticed that I’ve avoided discussing Manila’s LRT system. Mainly because that is fairly new and brings no nostalgic memories to mind but also because in my opinion the elevated rails have formed a blight on our once beautiful avenues. So please forgive. 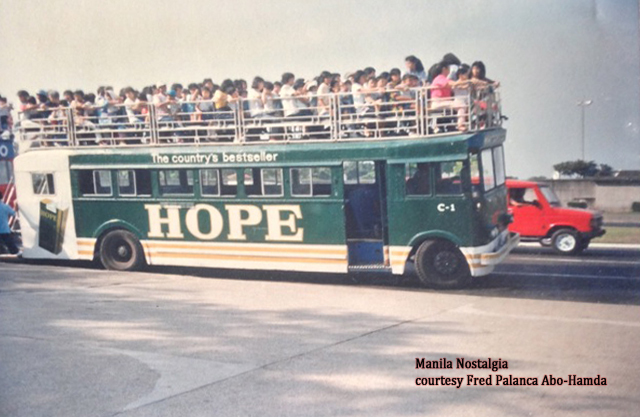 29 Responses to Manila’s Public Transportation – a pictorial essay. Another wonderful walk down memory lane. Thank you so much! Does anyone remember “Rabbitt Transport” in the 50’s? 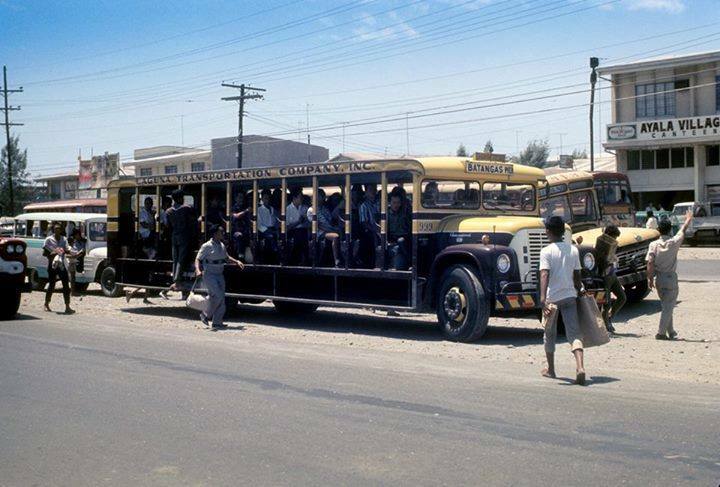 The story I heard growing up was that the American owner of the bus company named it “Rapid Transport” but when the first bus was painted it was misspelled and became “Rabbitt Transit”. Apparently the owner had a sense of humor and left it that way and even included a picture of a rabbitt on the side of subsequent busses! Is this the Philippine Rabbit that I used to know? Thank you Lou for another great read. It was educational and entertaining. I always learn from your blogs! Lou, thank you so very much for your blog. Even though I only lived in Manila for just about five years, I find your blogs intriguing. They are always well written and very informative. I found it very interesting the American (European) dress and the American names on the buildings, not at all what I would have expected. 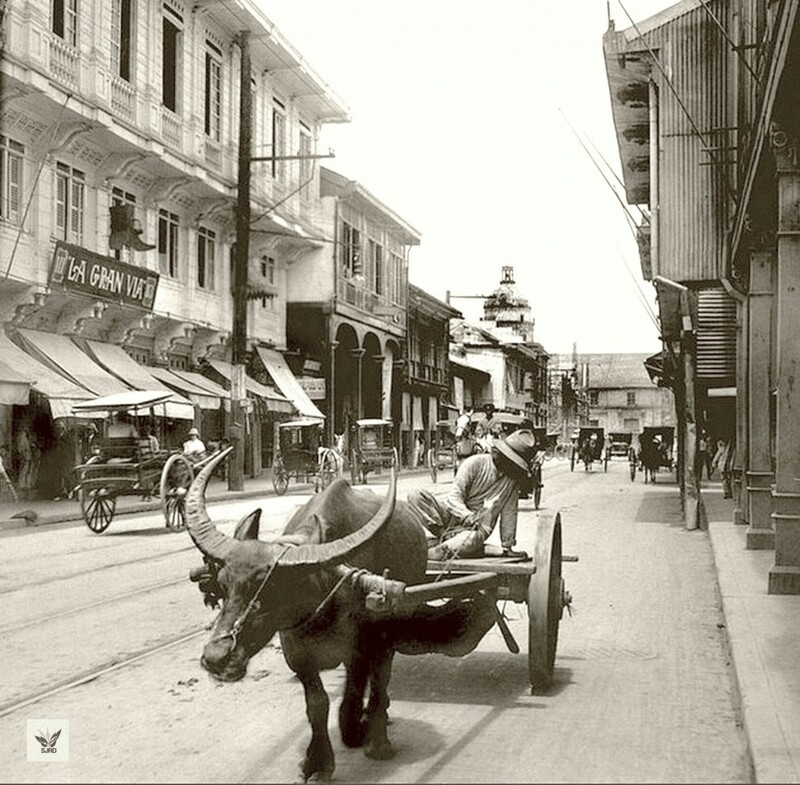 Thank you again Lou for your look back to the “Old Manila”. a very good read, lou! very informative and nostalgic … literally, a drive down memory lane. Lou thanks for the trip in history. I enjoyed it very much. It was 10 centavo fare on a jeep to Sta. Cruz in 1962. I walk from San Marcelino/Harrison Blvd and get the ride at Taft in front of Nicfur or Aguila Glass and get off at Lope de Vega to walk to my elementary school on T Alonzo. I was in fifth grade then. 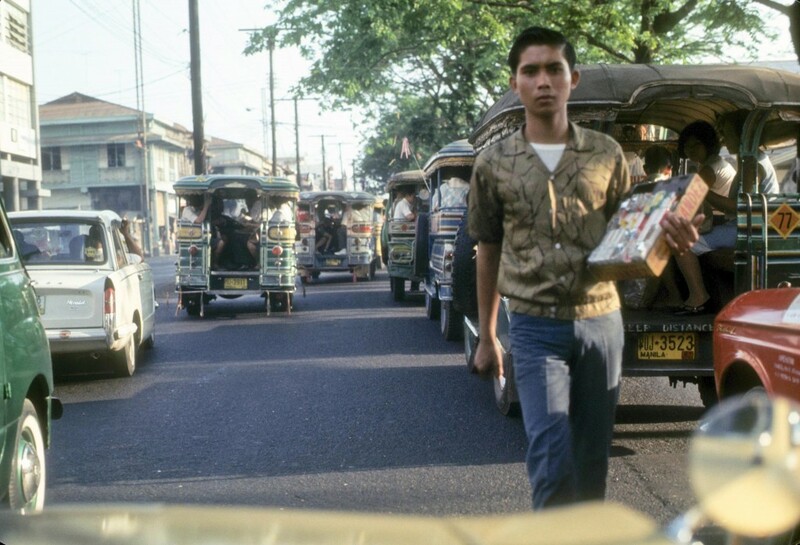 Coming home was same jeepney ride and get off at Remedios then get a Dilly at Dairy Queen or a popsicle at the grocery store on Pennsylvania. There were times, I walk on Rizal Avenue while window shopping then take the ride by bus on Echague to Ayala Bridge, right on Concepcion and left on San Marcelino but it turns left on Herran and right on Singalong. 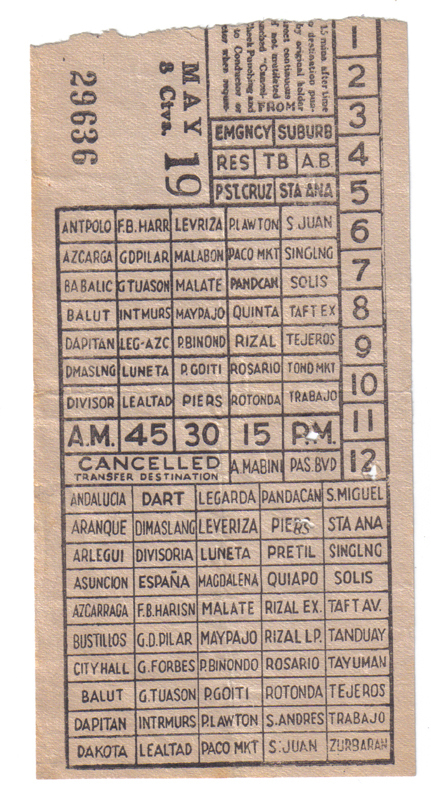 The fare was 5 or 10 centavos more. 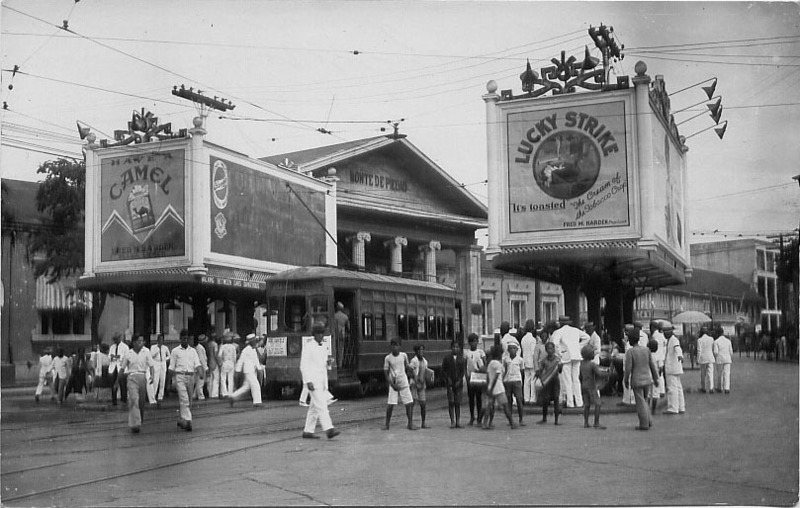 The Pasay line of the Meralco tranvias ran from Plaza Goiti to Luneta to M. H. del Pilar to Pasay. Our stop was the corner of Remedios, right before the Malate Church. 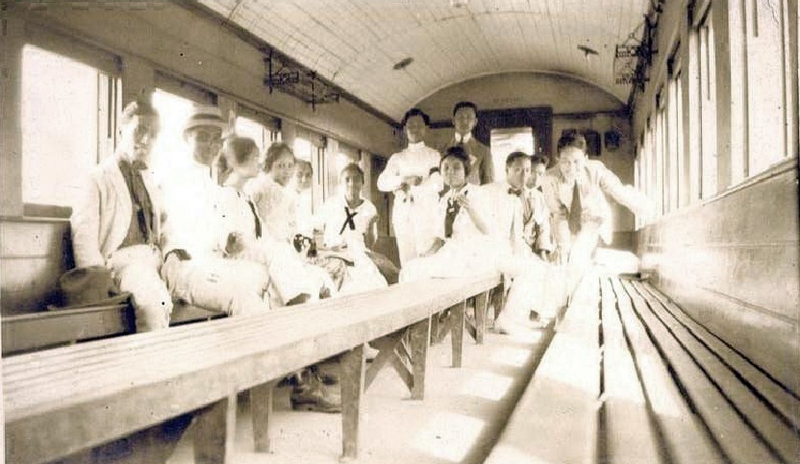 Seats in first class faced forward, in second class the seats were wooden slats along the sides. 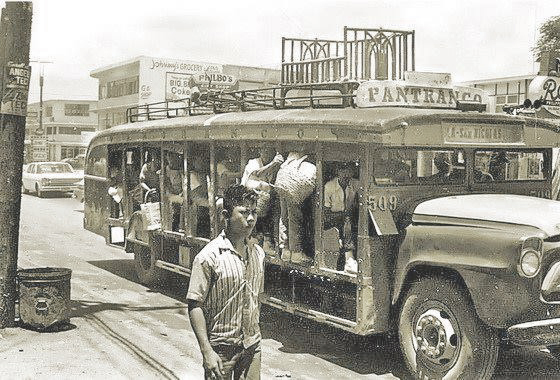 Fares were 10 centavos for first class in the front end, five centavos second class in the back. All staff wore white uniforms and yes, the cars were bright orange in color. Another great article. I lived at the South Syquia Apts on M.H. 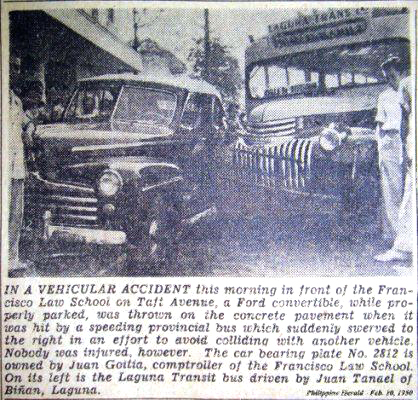 del Pilar and took the jeepney to school at St. Scholastica near Taft Ave. then to America School for my high school years. I also did a lot of walking as jeepneys did not have a direct route. I was always safe and traveled alone. When AS moved to new area, I worked at the school from 63-64 and then took a taxi which I shared with younger brother who was in grade school. Iloved it very much more sharing and photos please. I monitored your blog every day fornew post. Istar Tarriray. I’m sure that Philippine Rabbitt is the same company that I’m remembering. To my knowledge there was only one company known as Rabbitt Transit! I’m glad that someone else remembers it, and that I didn’t just dream it up, however I don’t know if the story I heard about rabbitt being a mispronunciation of rapid is true. I’m hoping that Lou Gopal will be able to dig up the story behind the name. 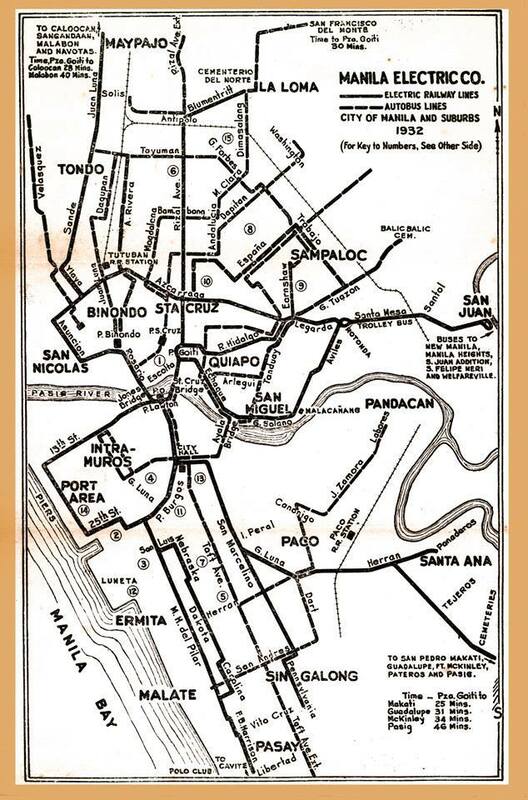 Hi Lou!…..Very Nostalgic….Dedios (yellow) and JD (Red) are well known Buses during 60’s, we have a house in Cubao and there was a route of these Buses going To Project 2 & 3, Aurora Blvd to Luneta. We used to ride with JD going to Luneta and some kids with their parents will drop by in Arcegas Store in Q.C. I am a magazine editor/writer doing a story on the tranvia. I would like to know what your primary sources of information were in writing your blog entry. I would appreciate an email. Thank you! Wow sir! Where did you get all these photos? I’m amazed! 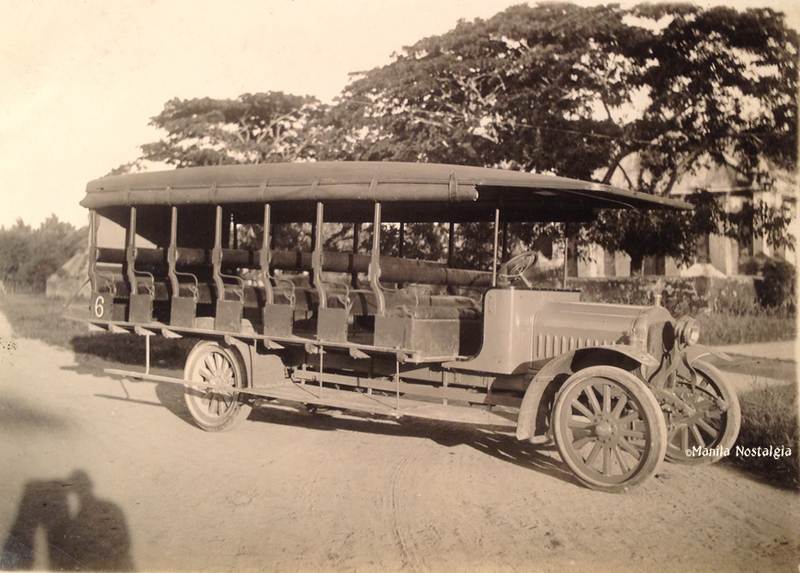 JD had a sister company called MM Lines plying the West Avenue/Pag-asa route in Q.C. All of their buses are flat nosed Mercedes Benz’s. There is a local reference among PhilAm and West Triangle residents when asked in what manner they arrived or come. If the response was ‘Pulang Chedeng’ meaning a ‘red Mercedes Benz’ that means they came by bus. Lovely read! C”,) And what beautiful photographs. Maraming salamat for keeping Manila’s past alive. I love taking nostalgic trips through your postings. 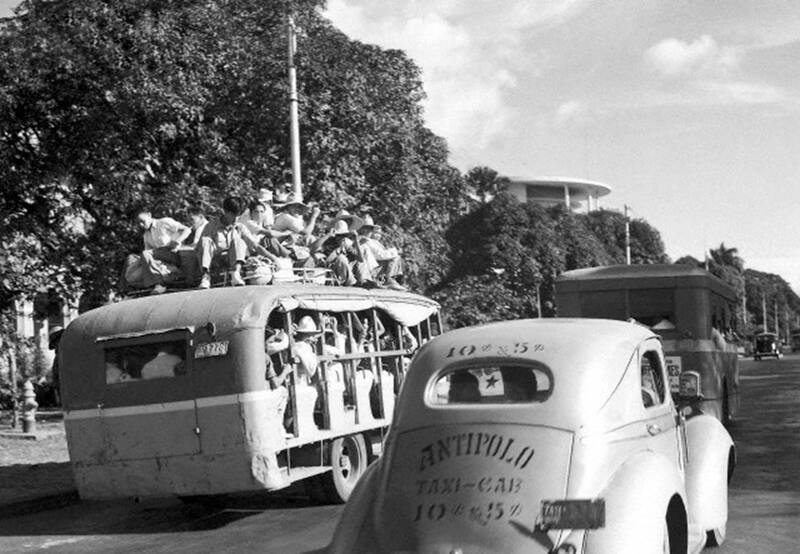 I was born 1945 so I did not get to see the tranvias, but I sure saw some of those calesas, taxis, jeepneys and buses! 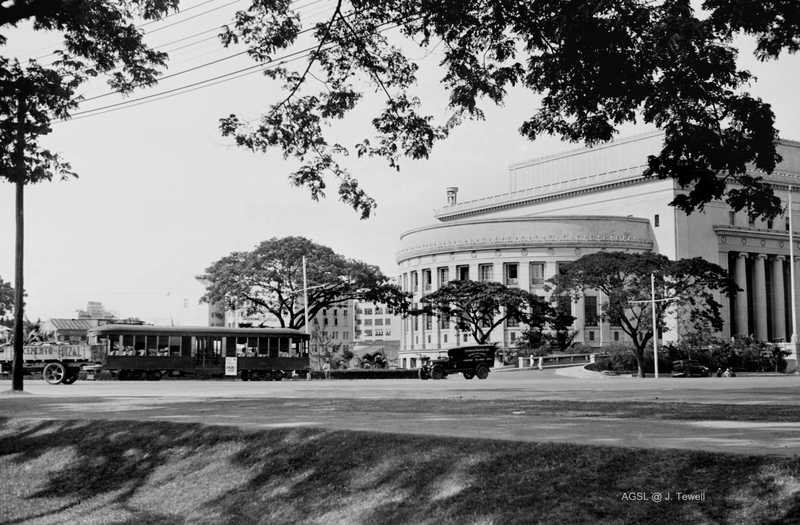 Can anyone, please, help me find a photograph of one of the eight trolleybuses (electric buses with twin overhead wires) that arrived in Manila in 1928? 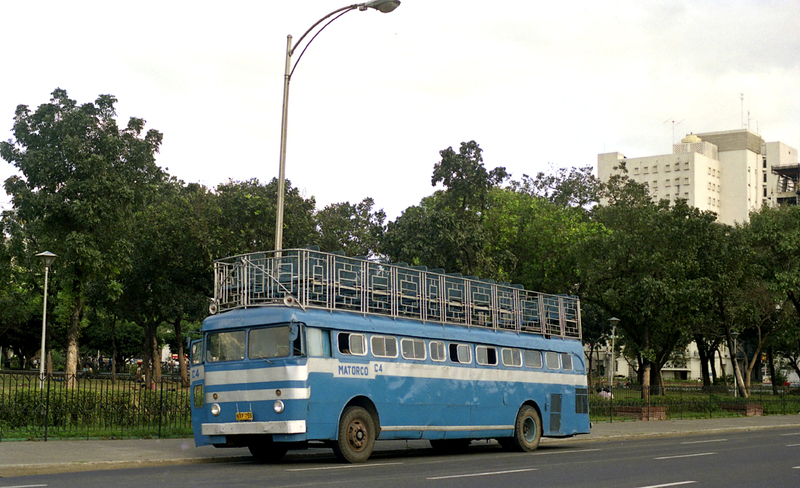 They were built in Ohio, USA, by Twin Coach Co.
Also, can anyone please tell me the route on which they ran? 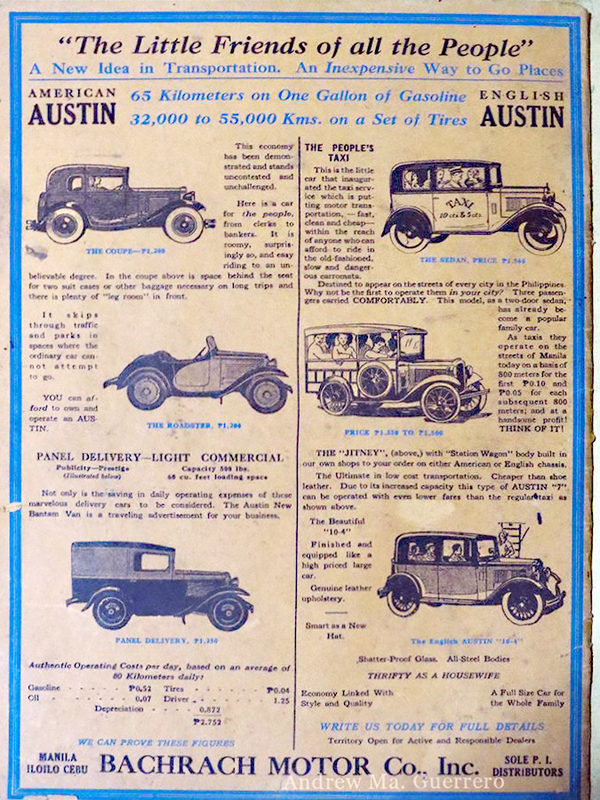 I have these facts: January 1924 – January 1928: 10 cars; February 1929 – 1941: Livery: ? ; Routes: Short town route, 2401?-2801? 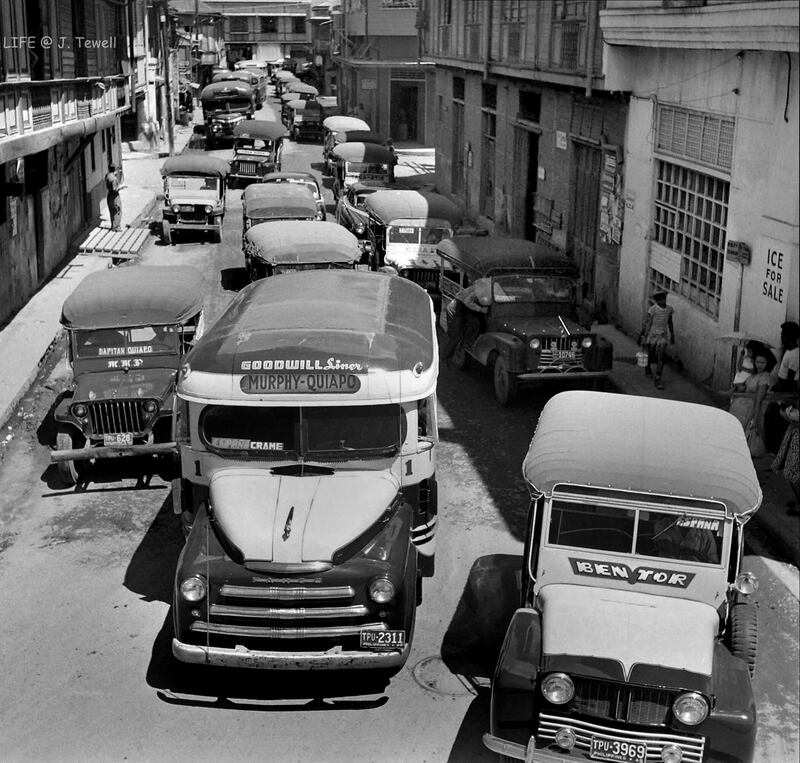 ; Route San Juan – Santa Mesa, 2902?-41? (destroyed ine the war) Fleet (2) Atlas-GE-Atlas 1924-28: 701-08: Twin Coach 40TT-GE-Twin Coach 1929-41. The first vehicles had solid tyres. I am sorry I haven’t found any photo at all. 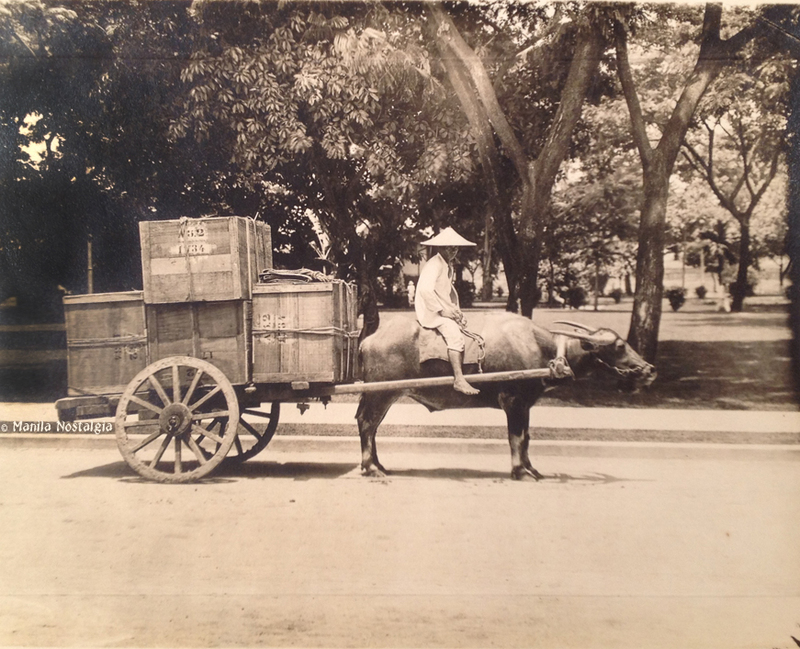 Lopez Museum has a collection of old Meralco photos. I explored their archives in 1978-79. They had a picture of a trolleybus. Thank you, I shall e-mail Lopez Museum. Once you knew what the typical fare was between two places, it was very easy to “negotiate” a “no meter” rate for about 65% of the metered rate. I used to do this when going to the US Embassy from Makati. The drivers usually asked me when I was returning because they wanted the same deal. So I’d have a taxi waiting for me when I was ready to come back. This article is an absolute delight. Than you very much Lou. I hope you can one day write a new series on Filipino painters as you once mentioned to me in an email you sent me. And I would be so interested to know what you can discover about Fabian de la Rosa. 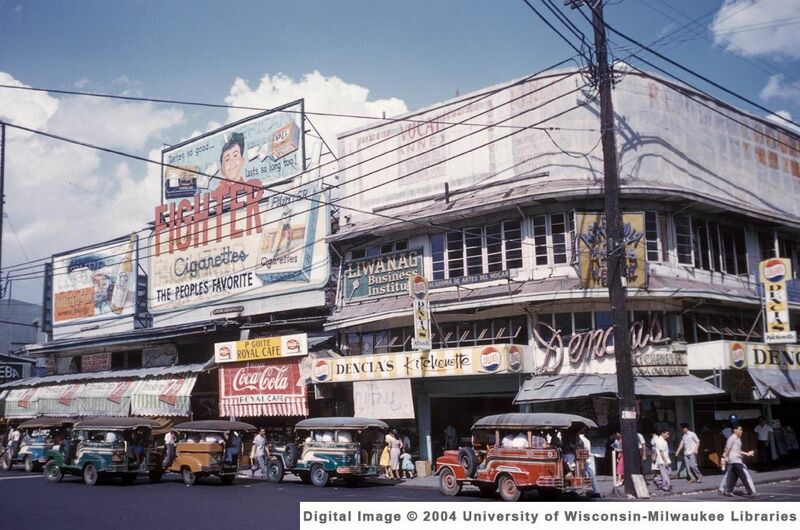 You are doing a great job with Manila Nostalgia. I sure hope God keeps you healthy for a long long time. 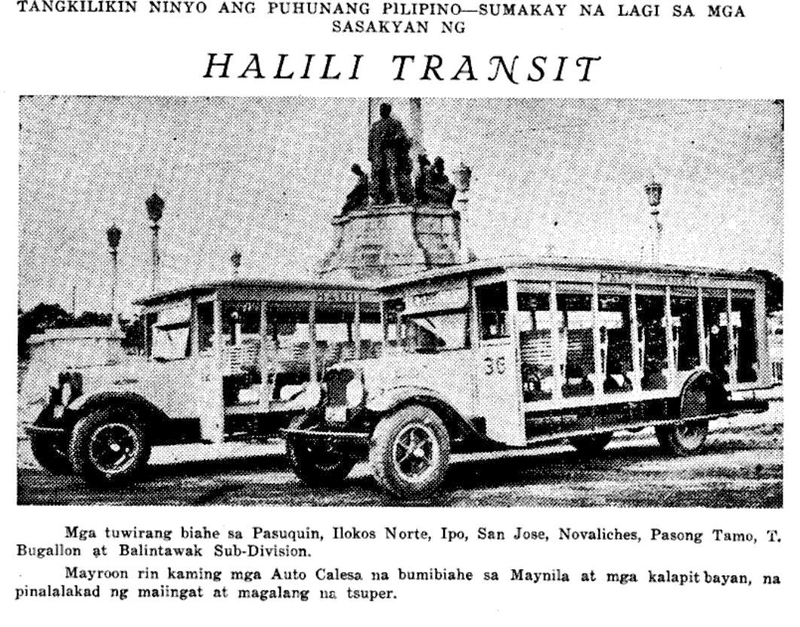 I was looking for pictures of the old IH Saulog or San Rafael buses that plied the Cavite City-Lawton route. I can’t imagine those wide-bodied buses passing through the cramped Las Pinas and Paranaque highways. Most often, they raced against each other. Another job well done Lou. Thanks. Thank you Sir Lou! I feel so blessed to have stumbled upon your great blog! Wow! 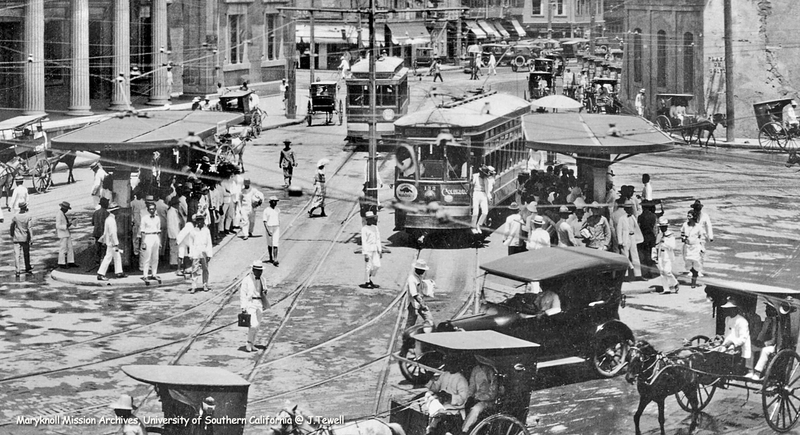 Back when Manila was the “Pearl of The Orient”, every roads weren’t so full of traffic due to discipline. But now, when you say “EDSA”, you think of traffic.